Initial site 123 – How to remove? What is Initial site 123? 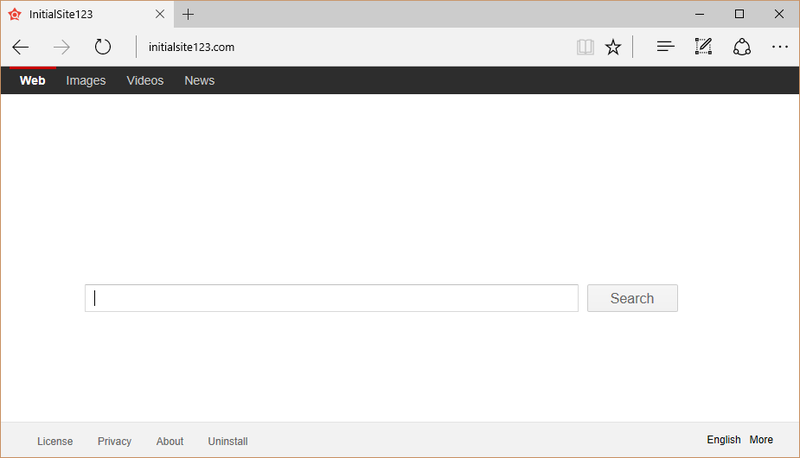 Initial site 123 is a search tool known to be a browser hijacker. It is similar to luckypageing123.com and many other websites that pretend to be trustworthy search engines in order to convince users to let them stay set on browsers. The real truth about all these search tools is that they are typical browser hijackers created to generate the pay-per-click revenue for their authors. In order to generate money for them, they provide the sponsored content users are expected to click on. Clicking on all these advertisements they display for users might be a dangerous activity, but, unfortunately, it is an arduous task to avoid those ads. It is because they usually take the form of ordinary search results search providers show to users, and only experienced users can say that there is something wrong with them. There is only one way to avoid them – make sure they are not shown to you. In this case, you can do that by implementing the Initial site 123 removal, so go to do this as soon as possible. How does Initial site 123 act? Initial site 123 is not a trustworthy search tool even though it is promoted as one because it does not ask permission to change homepages and default search engines on browsers installed on users’ computers. It seems to be compatible with all popular browsers, including Internet Explorer, Google Chrome, and Mozilla Firefox, so sooner or later you will detect it if a browser hijacker enters your computer and applies changes. The problem is that users do not immediately realize that they have encountered a bad search tool even though they find it set on their browsers. It surely looks trustworthy, but it cannot be trusted due to ads it shows to users. These ads might be dangerous because it is known that they can redirect users to bad pages distributing malicious software. Additionally, these websites might try to extract personal information so that they could get money from selling it. If this has not convinced you yet to uninstall Initial site 123 from browsers, read the next paragraph. Why is Initial site 123 set on my browsers? Initial site 123 is called by specialists a browser hijacker also because it is set on browsers without the users’ knowledge. In most cases, browser hijackers illegally enter computers, so users often do not know anything about their entrance. Although these threats tend to enter computers illegally, it does not mean that it is impossible to protect systems from them. What we always recommend for users is installing security software. Do this after you delete Initial site 123 from browsers. How can I remove Initial site 123? The quickest and easiest way to delete Initial site 123 from browsers is, of course, the automatic removal method. Users are only expected to download a reputable scanner from the web and perform a full system scan with it. If, among our readers, there are users who like taking care of all things manually, they should go to set a new search tool and homepage instead of this dubious page. This will remove Initial site 123. Also, they can implement the manual Initial site 123 removal by simply resetting those browsers with altered settings.